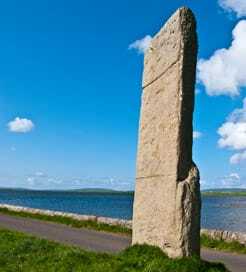 The Orkney Islands are an archipelago situated 16km north of Caithness in Scotland, commonly grouped together as Mainland, Northern Island and Southern Island. Once ashore you’re met with an aura of mystery, with the sparsely populated islands’ history stretching back 6,000 years, with a large number of tombs, stone circles and prehistoric sites waiting to be discovered. On Mainland’s west coast lies the best-preserved prehistoric village in northern Europe, known as Skara Brae. It Dates back 5,000 years and displays the original stone beds, boxes and dressers used by the people who lived there all those years ago. In the heart of Mainland lies another spectacle of prehistoric architecture; the tomb of Maes Howe. Buried beneath a large grassy mound, a series of tunnels lead you to an enormous central chamber. Vikings broke inside in the 12th Century and carved intricate runic lettering on the walls, boasting about their conquests, which are still visible today. The beautiful Italian chapel on the island of Lamb Holm is one of the most contemporary attractions. It was built by Italian prisoners of war in the 1940s using nothing more than two old Nissen huts and pieces of scrap metal. It’s a truly remarkable feat and boasts a stunningly decorated interior. The islands’ exciting wildlife attracts many visitors as well. Around 15% of the world’s seal population live here, so be sure to spend an afternoon admiring these wonderful animals lazing on the shore. Every year between May and August, the islands are flocked by puffins. You can spend hours watching these fascinating birds clambering along the cliffs and diving into the sea in search of food. 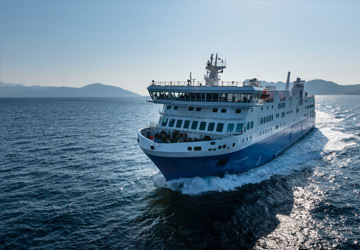 The fastest ferry route to the Orkneys departs from Gills Bay in Caithness, in northern Scotland, arriving in St Margaret’s Hope. There are also frequent crossings from Scrabster and Aberdeen, on the east coast of Scotland, as well as from Lerwick in the Shetland Islands, north of the Orkney archipelago. "Ferry from Aberdeen to Kirkwall "
Was given very good instructions at time of booking, knew when and where to board and that was helpful. The crossing was comfortable, would highly recommend paying the extra for the tip back seats, so comfy. The on board meal and services were great. Our ship was late in arriving but we were advised right from the beginning and appreciated that. For more information, please visit our Ferries from Scotland to Orkney Islands page. For more information, please visit our Ferries from Shetland Islands to Orkney Islands page.